What child does not already wear "his heart on his sleeve"? We decided to take a literal interpretation of this phrase to come up with the following game for our upcoming Valentine's/Kindness Day Party. "Are You Wearing Your Heart On Your Sleeve?" Instructions: Gather children in a circle. First, explain what it means to "wear your heart on your sleeve" before explaining the rules of the game. 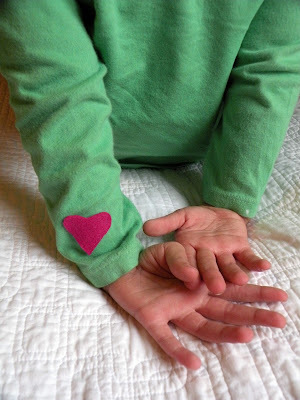 Next designate one child as "it" and have him sit in the center of the circle (eyes closed) while you place the heart on the sleeve (near the wrist works best) of one of the other children on the outside of the circle. All children will place their hands behind their backs as if to disguise the "heart on their sleeve". The child who is "it" will now open his eyes and try to guess who has the heart by asking each child one at a time, "[Insert Name Here], Are you wearing your heart on your sleeve?". The child asked will then bring her arms in front of them revealing if she is/ is not wearing the heart. This continues until it is discovered who is wearing the heart on their sleeve. That individual is now "it" and the game begins again. 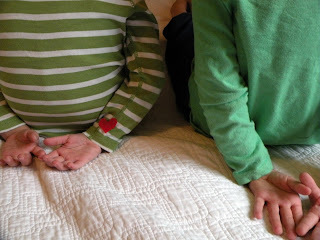 There is something so endearing about hearing small children ask each other if they are "wearing hearts on their sleeves". This game also reminded me of the fun we had last year playing "Don't Break My Heart" and "Did You Steal My Kiss" (pretty sure part of the reason in creating those games as well was to hear little children say those phrases in such a heartfelt manner). 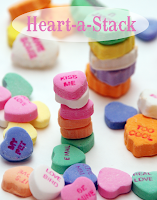 Did you/have you already started to plan your Valentine's/Kindness Day Party? I'm planning on stealing two of Kristina's games from last year, "Hug, Hug Kiss" and "Heart Walk". [Pictured from left to right] Steal My Heart by Family Fun, Conversation Hearts Bingo by @Home with Gina C., & Stack The Hearts by Simply The Sweet Life. Not pictured: Heart Hunt, and Catch My Heart. Speaking of hearts . . . have you read about The Heart Project yet, or entered to win our heart giveaway pack? This sounds like a really sweet game! What a sweet and easy game.